Background: Protein kinase B or Akt (PKB/Akt) is a serine/threonine kinase, which in mammals comprises three highly homologous members known as PKB alpha (Akt1), PKB beta (Akt2) and PKB gamma (Akt3). PKB/Akt is a growth-factor-regulated protein kinase which contains a pleckstrin homology (PH) domain. Binding of phosphoinositide 3-OH kinase products to the pleckstrin homology domain results in translocation of PKB/Akt to the plasma membrane where it is activated by phosphorylation by upstream kinases including the phosphoinoside-dependent kinase 1 (PDK1). Key roles for this enzyme can be found in cellular processes such as glucose metabolism, cell proliferation, apoptosis, transcription and cell migration. Formulation: Lyophilized from 1.2 % sodium acetate, with 2 mg/ml BSA and 0.2 mg/ml NaN3. Reconstitution: For rehydration reconstitute in 1.2% sodium acetate or neutral PBS. 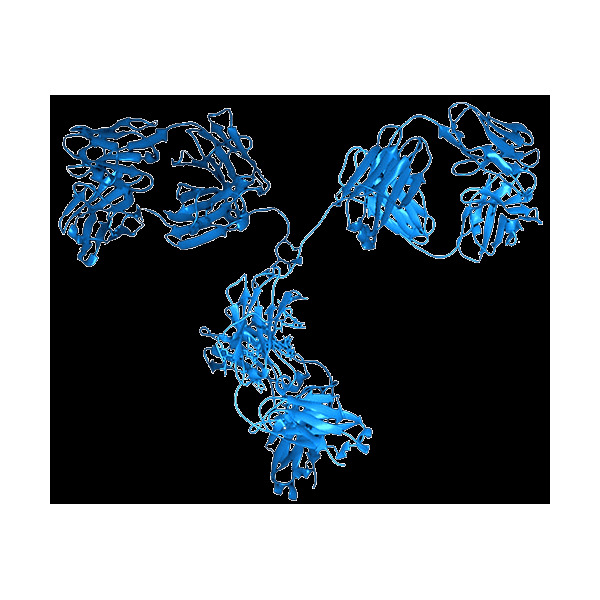 If 100 µl of PBS is used, the antibody concentration will be 1 mg/ml. Working Dilutions: Antibody dilutions should be based on tissue type and expression level. Staal, S. P.; Huebner, K.; Croce, C. M.; Parsa, N. Z.; Testa, J. R. : The AKT1 proto-oncogene maps to human chromosome 14, band q32. Genomics 2: 96-98, 1988. Ackah, E.; Yu, J.; Zoellner, S.; Iwakiri, Y.; Skurk, C.; Shibata, R.; Ouchi, N.; Easton, R. M.; Galasso, G.; Birnbaum, M. J.; Walsh, K.; Sessa, W. C. : Akt1/protein kinase B-alpha is critical for ischemic and VEGF-mediated angiogenesis. J. Clin. Invest. 115: 2119-2127, 2005. Chen, J.; Somanath, P. R.; Razorenova, O.; Chen, W. S.; Hay, N.; Bornstein, P.; Byzova, T. V. : Akt1 regulates pathological angiogenesis, vascular maturation and permeability in vivo. Nature Med. 11: 1188-1196, 2005.